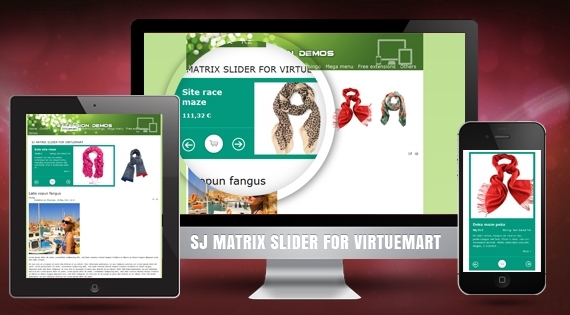 SJ Matrix Slider for VirtueMart is a great module that has been released for Joomla 2.5. This module is a perfect solution to help your hottest products are presented with many types of effect. It is designed full width slideshow, the same background for all slides along with jQuery easing which can make your animations look a lot better, you can place module right on home page or any positions. Especially, this VirtueMart Joomla module has full responsive layout and adapts perfectly for all device resolutions. In addition, dozens of features and effects are included, parameters can be configured in the back-end, you can totally set up product on your store with images, titles, brief descriptions, price and detail button... as your wish. SJ Matrix Slider for VirtueMart would be increase conversion rate for your VirtueMart store.